Children need a structured program to channel their energy sometimes, improve their focus and listening skills, and aid their physical development. YOU need a program that’s going to reinforce the discipline and life skills you’re trying to teach at home. 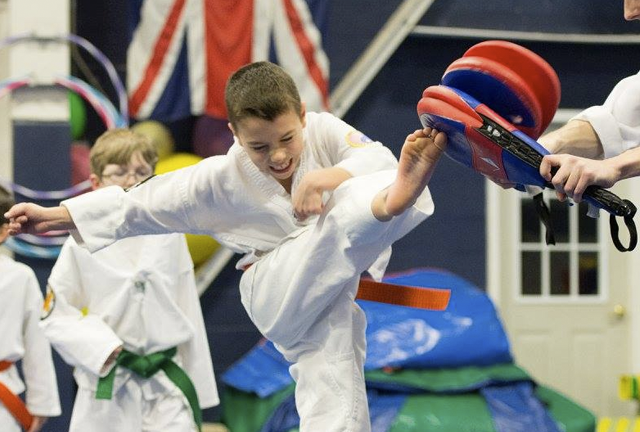 Register your child for our action-packed 60 minute white belt classes once per week. 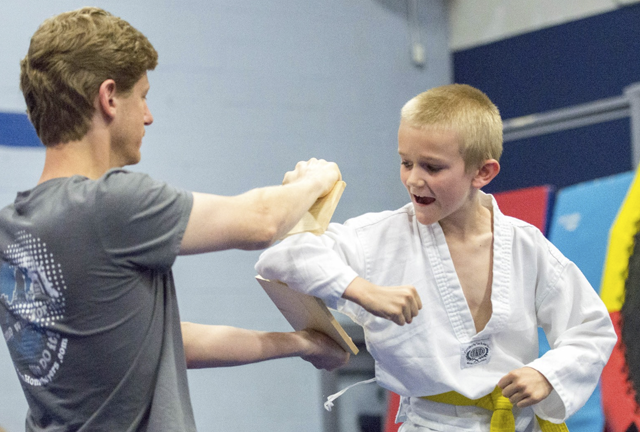 Our certified Black Belt instructors guarantee improvements in focus, active-listening, self-control, and physical abilities in as little as 45 days or 6 classes. Children advance in rank as well as develop a sense of accomplishment. Nothing prepares children better for the long road to becoming a black belt! 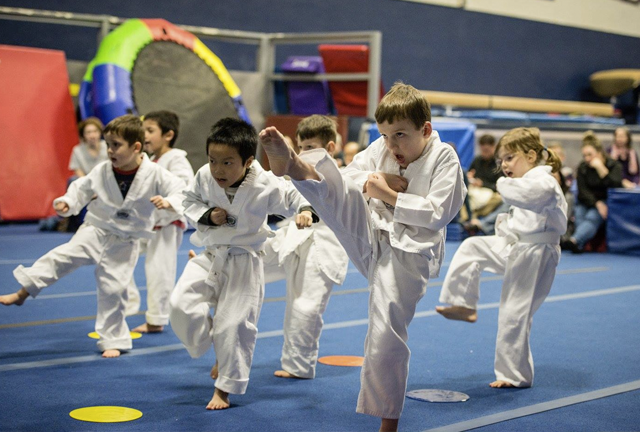 Participation in organized sports provides an opportunity for children to increase their physical activity and develop physical and social skills, Not all Martial Arts schools operate alike in this area; setup a trial class today. Unfortunately we live in a different world than our parents did. Give your child the skills and understanding to defend themselves in a variety of situations whether Physically or Mentally. The principles introduced during White-Belt are refined into the beginning of a full-fledged system of physical fitness and self-defense. 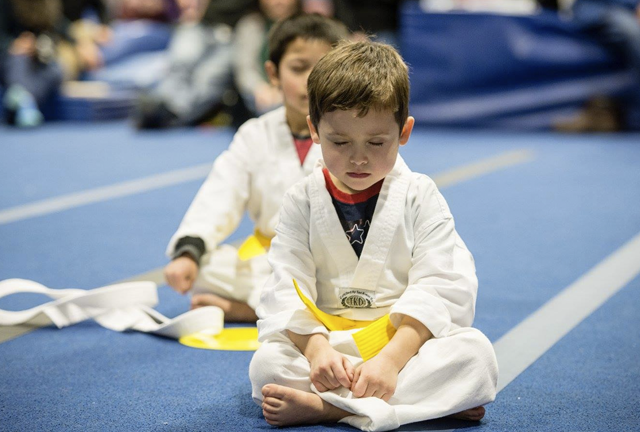 Yellow Belts are challenged to improve their balance and coordination; and through these efforts, also begin to understand the rewards of hard work and perseverance. Our Yellow belts are required to attend 2 practices per week. This class is 60 Minutes Long. Yellow belts are asked to practice 2 core belt classes per week. Students will have reached a point in their journey where they may both take pride in their many accomplishments, and at the same time start to appreciate and wonder at the scope of the path ahead. At the completion of this level, students will be equipped with a comprehensive understanding of how to move both aesthetically and powerfully. This class is 60 Minutes Long. Orange + belts are asked to practice 2 core belt classes per week, while Green is asked to practice 3x per week with a minimum of 2 core belt classes. 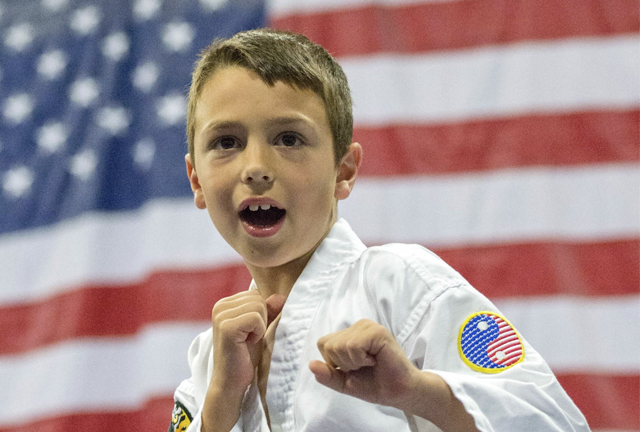 The high tier Color-Belt curriculum kicks Taekwondo training into high gear. Students will learn a myriad of choreographed self-defense routines which improve posture and poise in a way no other training can. Training for free-sparring begins and will both increase flexibility, strength, and endurance, as well as instill a healthy sense of assertiveness. These classes are 60 Minutes Long. Blue – Red is asked to practice 3x per week with a minimum of 2 core belt classes. This is an incredibly important milestone for any Martial Artist. Integrity means to have strength at every level; and thus to work diligently to surpass weakness and limitation. This belt level is characterized by an emphasis on affecting a greater command of the physics involved in training up to this point. As well as the ability to deconstruct techniques and teach them to others. This is where leaders are born and hard work defines their journey. These classes are 60 Minutes Long. Black belts are asked to practice 3x per week with a minimum of 2 core belt classes. Handling traditional martial arts tools, executing rolls and other maneuvers, this is a fun class to further build coordination, improve focus and refine martial art techniques! Lightweight padded nunchucks are safe, simple and amazing tools for cultivating concentration, honing self-control, and building confidence as this has WOW factor to peers. This is an awesome opportunity to learn, get fit, and have fun, side-by-side with your loved ones. This class rotates through all the fundamentals of our curriculum. Each week class will feature a corner-stone skill, so whether working over the bag with strikes, throwing precision kicks, or parrying each other’s punches, the class is always fresh and exciting! Master Dan is the program director of EDGE Martial Arts, and is both a Classically Trained Black-Belt, and Traditional Sah-bu-nim [Master-level Instructor]. He has a history of passionate dedication; with over 15 years of experience in the martial arts. 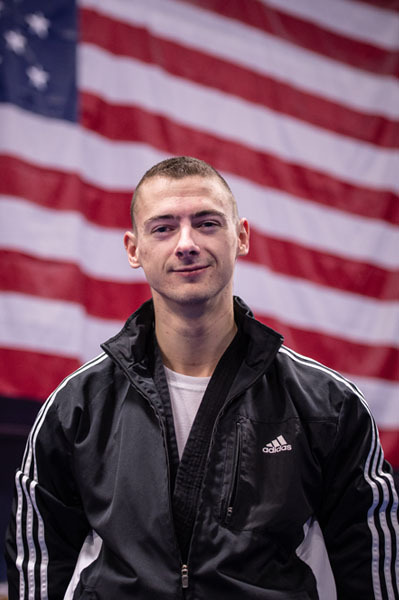 He leads the curriculum of the EDGE Martial Arts program; and sets the standard high with each and every class in order to assure the best progressions for his students. Having trained in Korean Tae Kwon Do, his abilities are as versatile as they are precise. Master Dan began his teaching career in East Longmeadow; instructing students in the art of Tae Kwon Do at the very same school he was taught in. After working and training in multiple schools–under the influences of various Masters–he eventually had a vision to create a special and unique program. One geared towards inspiring kids to excel in all aspects of the martial arts– ultimately, helping to launch the EDGE program. Yes! 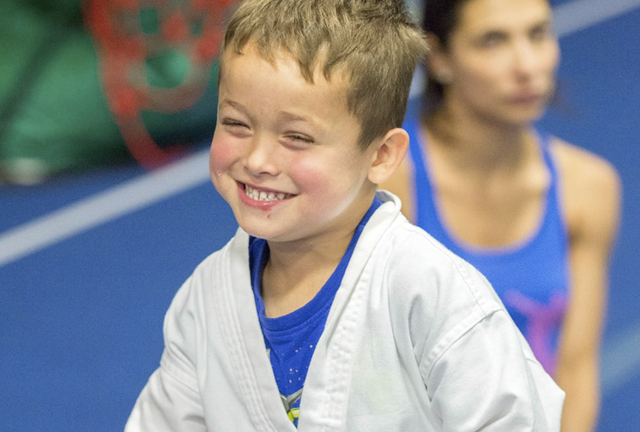 If you have a second child enrolled at the same time (gymnastics, tumbling or Taekwondo), the second child will receive 10% off monthly tuition. A 15% discount will be applied to every child after the 2nd. Please note: discounts are applied to the lowest tuition. Each belt has a set of curriculum, after successfully practicing that curriculum our instructors will invite students to our monthly belt testing days. Yes. It is a requirement of our program and the cost of a uniform can be found in our Pro-shop! Throughout their training students are reminded that being physically and mentally tough doesn’t allow one to be tough with others. Instead, TaeKwonDo students are expected to be humble, courteous, respectful and careful about when and where they practice their skills. The instructors continuously remind students that TaeKwonDo is a form of exercise and self improvement not a tool for bullying. The different martial arts all originated in different countries thousands of years ago, as forms of self-defense. Karate comes from Japan and Kung Fu from China. TaeKwonDo is native to Korea. 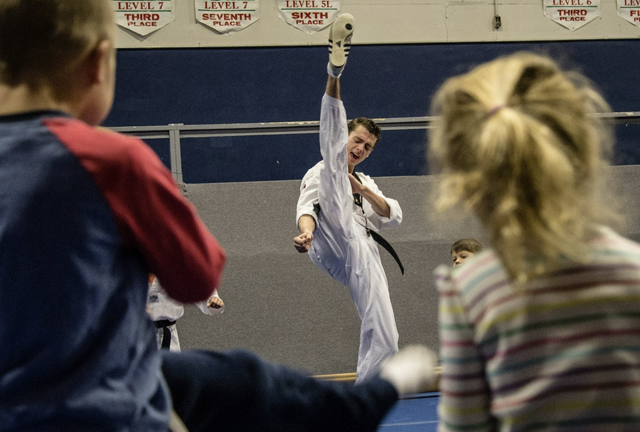 In terms of techniques, TaeKwonDo is known as the kicking art and emphasizes kicks more than other martial arts. it is ideal for improving balance, flexibility, coordination and endurance. Besides the physical benefits many people practice TaeKwonDo to improve self-confidence and to gain valuable discipline. In addition, TaeKwonDo is one of the fastest growing sports in the world and is the only of these martial arts that is a sport in the Olympic Games. Currently more people study the art of TaeKwonDo than all other forms of martial arts combined.